If you’re contemplating going plastic-free or zero-waste in the kitchen, start hoarding jars of all sizes now. Keep them out of the recycling, search the backs of cupboards and your attic and hound your friends and coworkers for theirs. Before you know it, you will have amassed a pile of them. 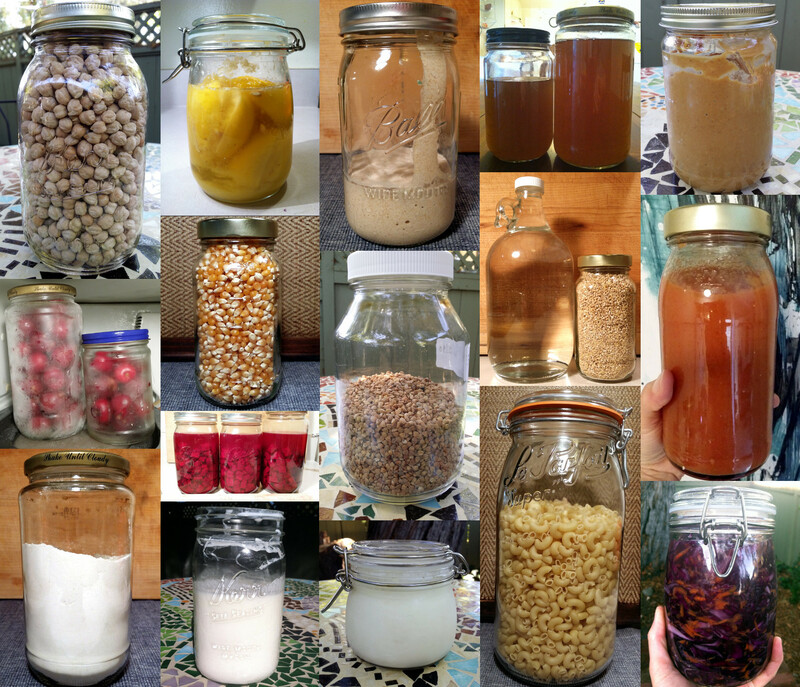 I rely on the large ones the most (as you can see in the jar collage below) for storing food and for filling up with bulk food. Some stores will “tare” jars. After you fill them up at the bulk bins, the cashier will deduct the weight of the tared jar when you check out. Smaller jars are good for buying and storing spices, tea and other expensive bulk items. Filled with beans, rice, grains, seeds and nuts, your glass jars look great on a kitchen shelf. I keep a stash of jars inside my cloth shopping bags, so I won’t find myself at the store empty-handed. 1. Garbanzo beans a.k.a. chick peas. If you go zero-waste, you’ll probably start to eat more beans and legumes. They provide a good source of protein, cost little and unlike meat, are easy to buy waste-free. I bought these in bulk in a cloth bag and transferred them to the jar at home. 2. Frozen cherries. My daughter picked these for us at her dad’s last week. We had so many, I pitted and froze some for later. 3. Bread flour. I make bread from wild starter (see #8) and add about 25 percent bread flour. I bought this in bulk in the jar. 4. Preserved lemons. I preserved these using this recipe (so, so easy). The lemons came from the kids’ dad’s backyard. 5. Popcorn kernels. I bought this in bulk at Rainbow. I make popcorn following this ridiculously simple recipe. 6. Beet kvass. I started this fermentation yesterday. You can buy fancy glass containers for fermenting food, but I just reuse mason jars or pickle jars for these science experiments. 7. Buttermilk. This is also very easy to make (do you notice a theme?). Here’s the recipe. 8. Sourdough starter. My pride and joy. I use this rather than commercial yeast to bake bread, and I (mostly) follow Michael Pollan’s bread recipe from his book Cooked. I had a different starter last year, but I let her die and started this new one. She wasn’t very perky. It may be because I had named her Heloise, of Abelard and Heloise, clandestine and doomed 12th century lovers. Considering how things turned out for them (Heloise’s uncle sent thugs to Abelard’s house to castrate him in his bed in the middle of the night; Heloise subsequently agreed to join a convent), the name may not have been the best choice. I haven’t named this new starter yet. I’m thinking Suzy or Kathy—something bubbly and cheery and ending in “y.” If you have a good name, please let me know. The short time-lapse video below shows my starter rise and fall after a feeding. Update: I went with the name Eleanor, after Eleanor of Aquitaine. Here’s how to make a starter of your own. 9. Buckwheat. This came from the bulk bins. I have a flour mill and I sometimes grind a little of this up for sourdough waffles or pancakes. When Charlotte and her friends were younger, they would ask “Can we please grind the flour in the flour mill [which takes forever and makes your arm feel like it will fall off].” I would always say, Tom Sawyer-like, “Well, I guess you can do it just this once.” Buckwheat has a lot of protein. 10. Yogurt. I made this myself. This is the recipe. 11. Vegetable broth. I save scraps of vegetables in jars and freeze them. When I have a big enough pile—and need broth—I make it like this. 12. Steel-cut oats. I also bought these at Rainbow. You can quickly prepare them the night before and wake up to delicious Irish oatmeal in the morning. Here’s the recipe. Someone gave me that glass moonshine jug in the pic for water. I live in an intentional community and we have a water filter in our community kitchen so I fill my glass water jugs up over there. 13. Pasta. I wish Charlotte loved pasta a bit less but I was happy to find all kinds in the bulk section at Rainbow. 14. Peanut butter. I bring my jar to Whole Foods and fill it up at the peanut grinding machine. You can also make it yourself in a food processor—just grind up peanuts. 15. Tomato sauce. I made this from fresh tomatoes and it’s easy. Here’s the recipe. 16. Sauerkraut. Probably one of most common ferments. Here’s my kraut recipe. I try to eat my microbes every day. I would like to participate in the American Gut project and find out what’s in my gut, but I’m also a little afraid to know. I love the jar collage. To be honest, I often fill up plastic bags at my local co-op, then fill the jars when I get home, but this is inspiring. I like the idea of keeping plastic out of the equation as much as possible. Thanks! I would think a coop would tare the jars. I also use simple cloth bags I sewed if I buy a large amount of something in bulk. I wrote a post on those if you’re interested. Mmm, I’m going to make your sauerkraut this weekend. Thanks for posting this! Great! Thanks for the comment. Let me know how your sauerkraut turns out or if you have any questions about it. I had to start to use glass jars because we did bring moths home with the dry food for guinea pigs. I can tell I am happy the moths came, because I find it pretty awesome. I use them for everything. I also make a breakfast into the small ones for 3 days and keep them in the fridge. I also use glass bottles for the small things like rice, sunflower seeds etc. It looks beautiful in it. Unfortunately we don’t have so many pretty glass jars as you have on your pictures. *Jealous* Especially I mean those where are the chickpeas :9 I wish i had a few these jars! I agree, food looks so appetizing in glass jars and bottles. You’ll have a nice collection eventually if you start saving them. I’ve been hoarding them for a few years and occasionally someone will give me one or two. It’s a bit crazy that we usually just throw out these beautiful and useful containers. I do this in my kitchen. I have even replaced my husband’s shaker cup for the gym with a similarly sized/shaped glass jar. We are now “that” couple that takes Ball jars with powder into the gym. Lol. Great idea! I see “those people” with their ball jars at my cafe occasionally and I always think “smart people” 🙂 I take a mug but my tea might stay hot longer in a ball jar. Very inspiring post! I’m going to try to implement some of these into my life. And Whole Food has a peanut-grinding machine?! Clearly I don’t get there enough. I am seriously going to stop there today just to find that and buy some freshly ground peanut butter. Thanks for sharing! You’re welcome! I’m glad you found the post useful 🙂 Just go to customer service with your jars and they will tare them for you. I would imagine they do this in all the stores, given the extensive bulk sections. Please let me know if I’m wrong about that though. OK, you’re probably pretty busy and you probably already know this but have you considered growing your own beans, too? 😉 Dry beans are actually kind of easy and it’s so much fun plucking them and popping them into one of those handy glass jars. Anyway, thanks for the tips & best of luck with the food stuff! I had no idea. Thanks for letting me know! I always assumed beans are complicated to grow. How do you do it? Well, you need enough sunlight, decent soil and some height (they’ll want to climb). I find that the seed packets really do have useful information in terms of the specific needs of the plant. I’ve been growing beans/peas for several years and found them pretty easy (unlike, say, tomatoes which I find very tricky!) Not sure where you live but consider finding someone local that you trust and see if they can guide you. Mentorship is a wonderful thing, especially when it comes to growing/preparing food! Good luck!!! Thank you for the info! I don’t have a lot of sunshine, but I do have one spot that might work (it’s in front of a fence to boot). I agree, mentorship is a great thing. We have forgotten so much about growing and preparing our own food. It’s a bit crazy. PS, if you don’t have a lot of room (or good soil), you might consider a grow bag. We use Smart Bags for our potatoes and peas (not at the same time, mind). Very easy and doesn’t take up that much space! Good luck!!! Thank you! Glad you liked it. I agree, packaged food is nothing to look at. Even just a few jars of dried beans can really warm up a kitchen. Thank you for following my blog and for yours! I too love the idea of saving glass jars, so much healthier for us and the planet. Thank you for the comment and for following 🙂 I love my jar collection. It’s crazy that we often just throw away such attractive and useful items. You know I’ve been keeping jars for ages (possible years) because once or twice a year I make jam and marmalade and you don’t want to run out then. But reading this post has given me a whole host of new ideas for using my jar collection. I just sorted all my button into colour coded jars and they look so pretty. Jars all the way from now on! Great! I’m glad you found the post useful. Buttons look great in jars as do so many everyday objects. And you can see at a glance what you have on hand. I have been collecting mine for a few years and basically covet jars now. I’m with you, jars all the way! What a great post! My ‘plastic-free’ August ran into some stumbling blocks like yogurt and popcorn so I really appreciate your suggestions. Thank you so much. I’m glad you found the post useful. Homemade yogurt and snacks were high on my priority list when I went (nearly) plastic-free. I especially had trouble finding cheese and dairy plastic-free. Pretty much ALL cheese where I live is swathed in plastic. It drives me crazy. Fortunately yogurt, buttermilk, and very soft cheeses like ricotta are easy to make and don’t take much time. I love the smaller tinted bottles (especially for vanilla) but only have a few of them. I recently bought more vodka to make vanilla and when choosing a brand, considered the shape of the bottle as much as the contents within 🙂 The one I settled on is so huge, it has a handle at the back. I’ll use it as a water jug when I finally empty it. It’s crazy to throw out these attractive and useful glass bottles and jars.